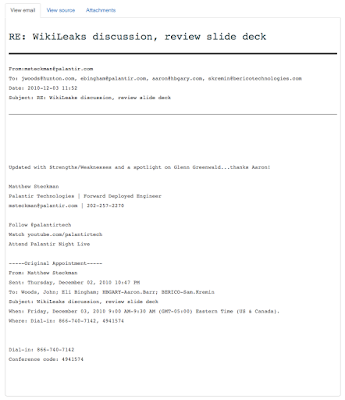 "Today, Tuesday 29 November 2016, WikiLeaks publishes in searchable format more than 60 thousand emails from private intelligence firm HBGary. The publication today marks the early release of US political prisoner Barrett Brown, who was detained in 2012 and sentenced to 63 months in prison in connection with his journalism on Stratfor and HBGary. 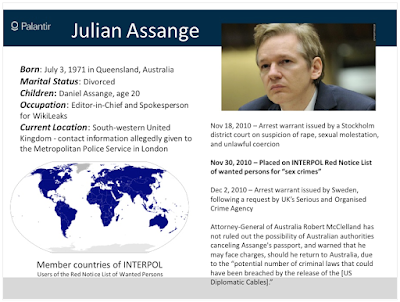 Coinciding with Mr Brown's release from prison WikiLeaks is publishing a searchable index of the HBGary emails. 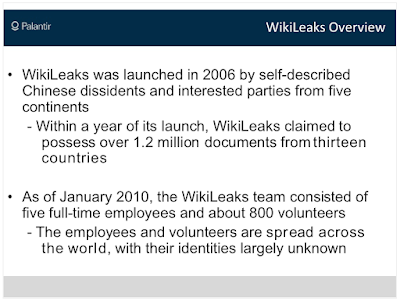 WikiLeaks published the Stratfor emails in 2012. The HBGary emails are from four email accounts of key people from HBGary and HBGary Federal. 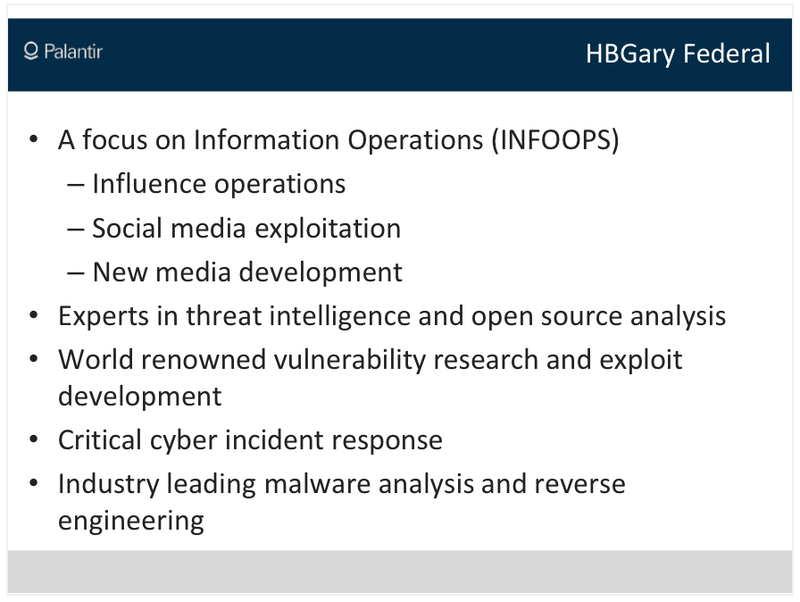 HBGary was founded in 2003 by Greg Hoglund to provide cyber security-related services to corporate clients. 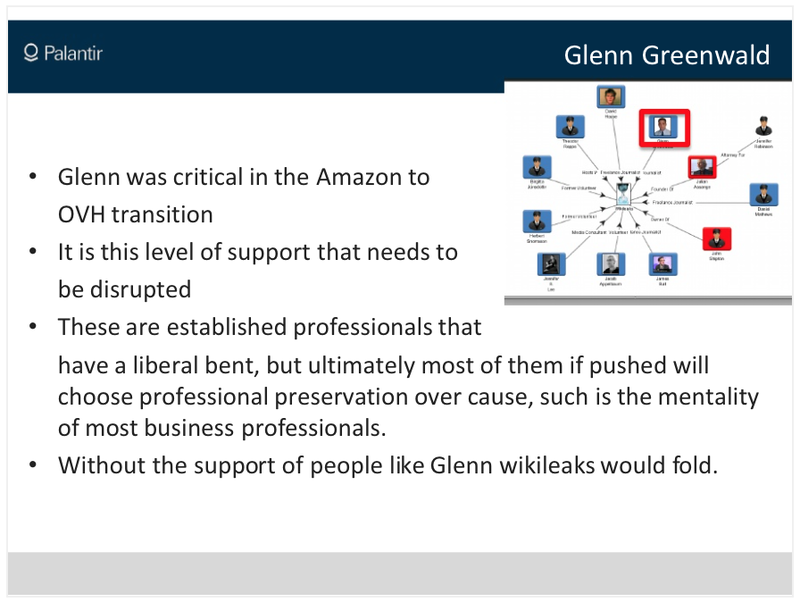 A separate entity, HBGary Federal, was managed by Aaron Barr to do similar work for government agencies and so had staff with security clearances and worked with companies such as Booz Allen Hamilton (one of the contractors Edward Snowden worked for). In February 2011 Aaron Barr did an interview with the UK’s Finanical Times that stated he had been investigating the internet activist group Anonymous and claimed to have uncovered the real identities of some of what he described as the leaders of the organisation. 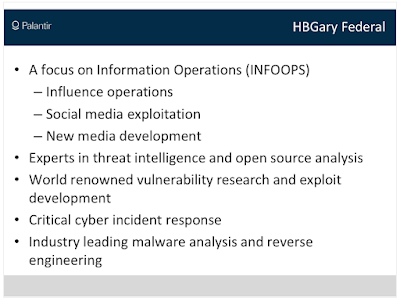 In retaliation Anonymous penetrated Barr’s organisation and took emails from the accounts of four key people from HBGary and HBGary Federal: Aaron Barr and Greg Hoglund, but also Ted Vera (then Chief Operating Officer at HBGary Federal) and Phil Wallisch, a former Principal Technical Consultant. These emails and revelations from them started to be published on the internet, predominantly through the work of Barrett Brown and a crowd-sourced investigative journalism project he ran: Project PM. As a result, later that month Barr was forced to step down, HBGary Federal closed and HBGary, Inc. was sold to ManTech International. This would have been little consolation to Mr Brown, who a month later on 6 March 2012 had both his and his mother’s houses raided by the FBI, seeking “Records relating to HBGary, Infragard, Endgame Systems, Anonymous, LulzSec, IRC chats, Twitter, wiki.echelon2.org, and pastebin.com.” Agents seized his laptops. Barrett Brown’s work through Project PM was one of the first collaborative investigations into the US corporate surveillance industry. Looking into corporate firms that work hand-in-hand with the government to surveil on citizens, Mr Brown was one of the first to shed light on this unaccountable industry. As you will see in this posting, this self-description is somewhat ironic. 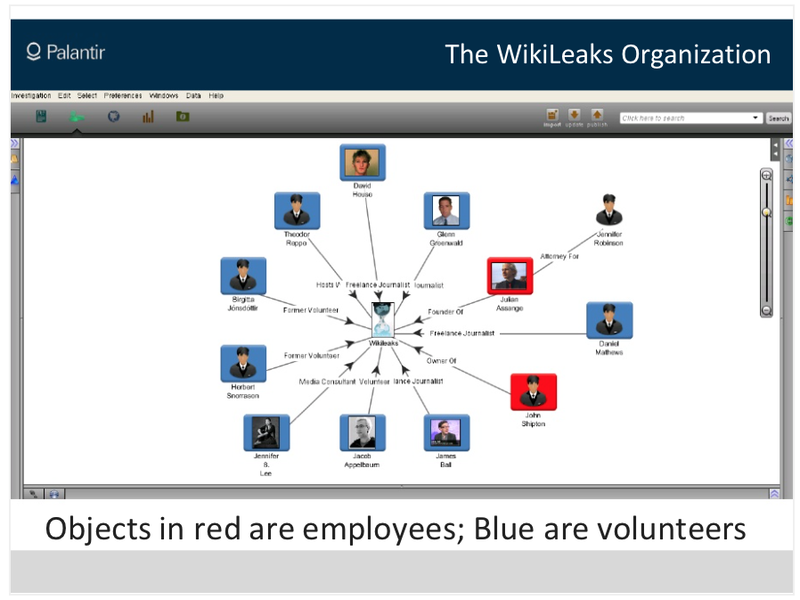 The presentation goes on to note that WikiLeaks uses a strategy of migrating their use of servers around the globe, making the organization far more difficult to trace (and shut down). As well, they are incorporated and registered in different countries that provide maximum legal protection; for example, at the time, they had a library in Australia, a foundation in France and two no-name tax exempt non-profits in the United States. 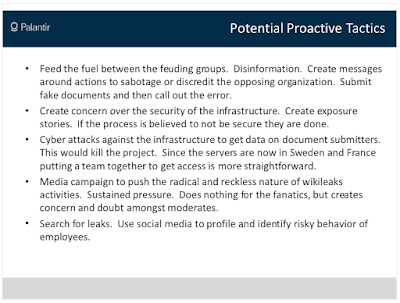 The presentation notes that their weakness is a lack of funding because governments are blocking their funding sources and that security concerns could be used to make potential submitters of documents to WikiLeaks doubt the safety of interacting with the group. 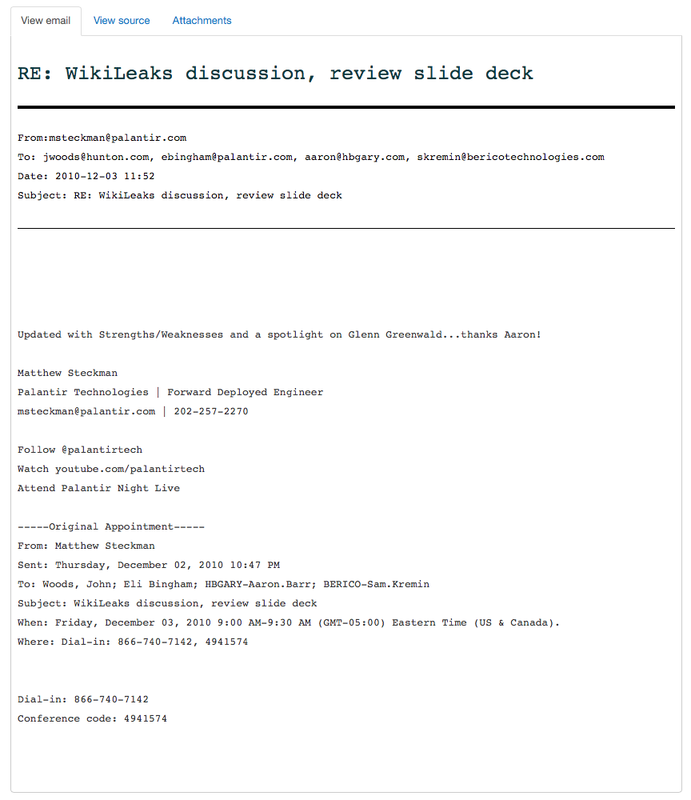 Note the use of disinformation through the submission of fake documents to bring WikiLeaks to its knees. 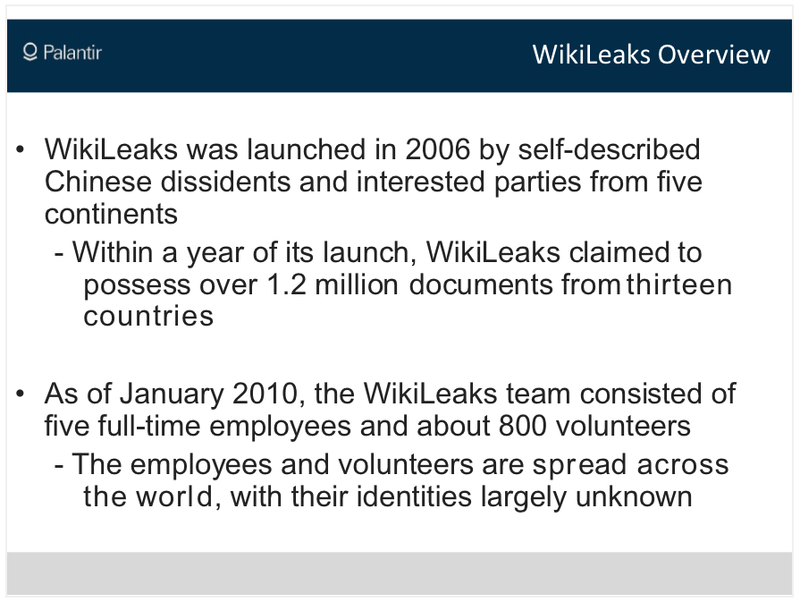 The plan by HBGary and its affiliates was to destroy WikiLeaks by having them release fake documents to the public. 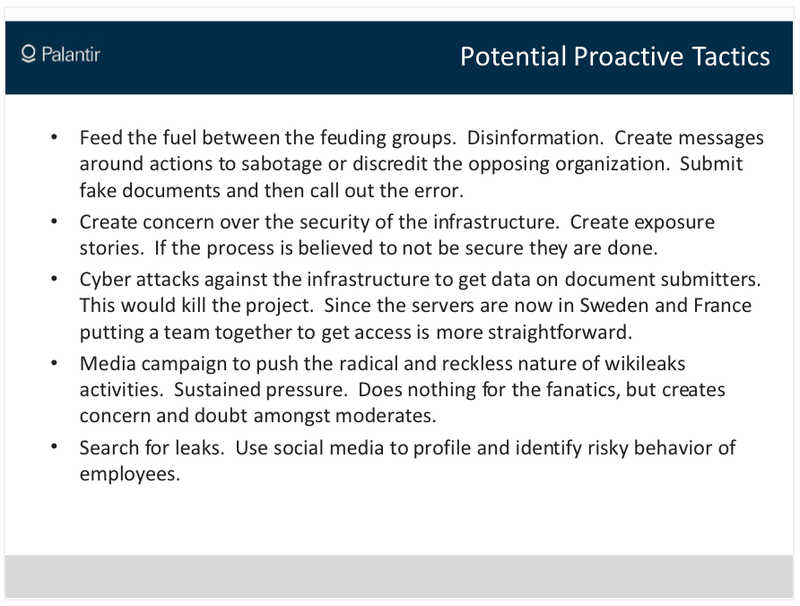 Additionally, they wanted to use cyber attacks against Wikileaks's server infrastructure and create the impression that supplying information to WikiLeaks was risky. This gives us an inside look at what lengths the Deep State will go to to keep information from reaching the public. 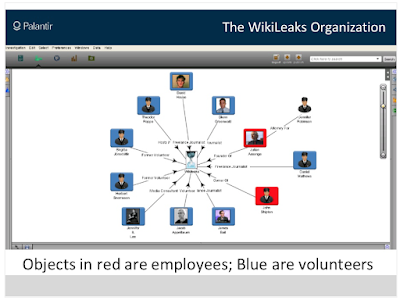 During the 2016 election cycle, the information released by WikiLeaks likely played at least some role in the final outcome of the U.S. Presidential race. 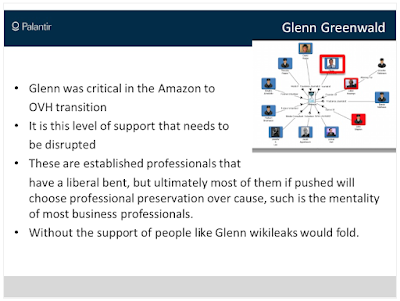 The loss of an organization like WikiLeaks would mean that so much more secret activity would go on behind closed doors, keeping the public from knowing what is really going on in Washington, Corporate America and other jurisdictions. After all, those who lead us would rather that the sweaty masses lived their humble lives without giving any thought to their true motivations.